Given the powerhouse teams that represented the Windy City in the 1870s and ’80s, one might assume that the quaint jargon signifying that a team had been “Chicagoed” stems from some unfortunate nine suffering a walloping at the hands of one of those mighty clubs. The truth is quite to the contrary. The term actually stems from a game played on July 23, 1870, when Chicago’s National Association entry became the first team ever held scoreless in a National Association championship contest. During the previous autumn, moneyed interests in Chicago pooled assets to assemble a team that would rival the Red Stockings of Cincinnati. 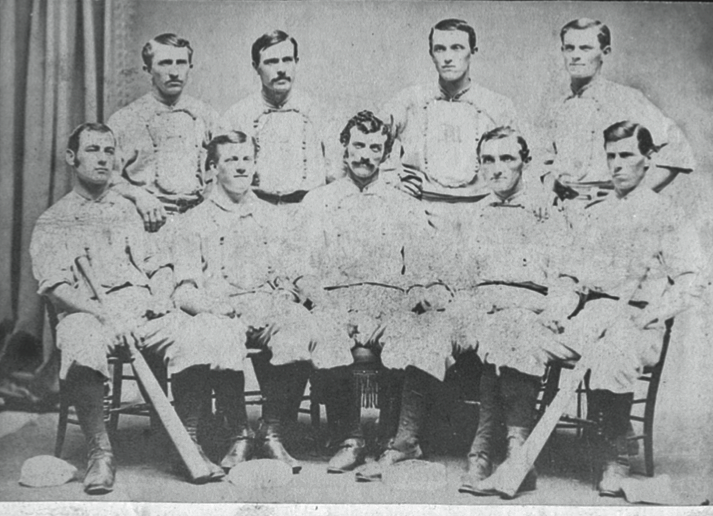 Essentially a “picked nine” of all-stars lured away from prominent teams including the Eckfords, Athletics, and Haymakers, the White Stockings won their first 31 games. On an early summer tour of the East, they suffered their first losses, one of them a 13–4 embarrassment at the hands of the Mutuals in New York on July 6. The Mutuals scored an unearned run in the first off pitcher Mark Burns, whom Chicago had plucked from Fordham’s Rose Hill club just after the 13–4 defeat.2 New York’s Rynie Wolters, who had beaten Chicago a fortnight earlier, faced only nine White Stocking batters through the third inning. Chicago got a man as far as second base in the fourth, but mounted a genuine threat only in the fifth. Right fielder Clipper Flynn led off with a base on balls. After Fred Treacey flied out to Dave Eggler in center field, Levi Meyerle garnered Chicago’s first safe hit, Flynn advancing to second. But when catcher Bill Craver flied out to Patterson in left, the Mutuals outfielder found Flynn straying and fired to second for a double play to end the inning. The New Yorkers turned up the heat in the top of the sixth. Wolters tripled past Ned Cuthbert in left, then hits by Marty Swandell and Eggler and heads-up running on a couple of miscues by Craver behind the plate brought three runs across. Opening Chicago’s half of the inning, Treacey lofted a long one to left, but was put out on a great one-handed catch by Patterson. The Tribune said the outfielder caught the ball “in one hand while running backward, making a catch as rare as angels’ visits.” Meyerle scorched a grounder past Hatfield and reached for the second time. Next up was Craver, who grounded to Candy Nelson at third to start what looked like a double play. Hatfield forced Meyerle, but his relay to first missed the target and Craver wound up at third. But Chicago’s best scoring chance yet went for naught as Burns popped out. After a scoreless seventh inning, the Mutuals put up another three runs in the top of the eighth, thanks to four hits and an error by shortstop Charlie Hodes. In the bottom of the inning, Cuthbert and Flynn reached base, but the former was caught stealing and the latter was stranded by Treacey and Meyerle. 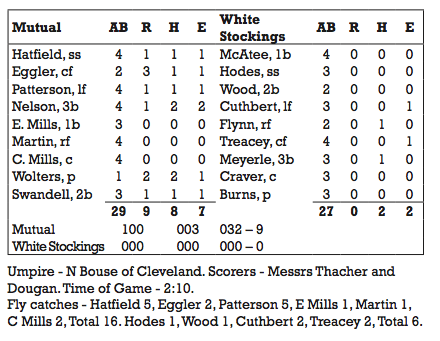 In the ninth, the White Stockings gift-wrapped a pair of runs for the Mutuals via three errors, two passed balls, and a wild pitch. Only a Hodes-to- Wood-to-McAtee double play prevented the damage being greater. Facing a 9–0 deficit, the Tribune said the White Stockings “seemed to have given up”3 as they took their last chance in the bottom of the ninth. Craver, Burns, and McAtee were all retired on infield flies. Newspapers in many other cities also reacted with shock and mockery, some judging that Chicago’s vaunted “$18,000 Nine” had been proven a horrible investment. The New York Herald appears to have been the first newspaper to use the term “Chicagoed” to indicate being held scoreless, doing so on July 27.6 Two days later, the Cincinnati Commercial Tribune predicted that “‘Chicagoed’ will hereafter be used to indicate a blank score, instead of the less elegant term whitewashed.”7 After Cleveland beat the mighty Mutuals on July 29, the Cleveland Plain Dealer quipped: “The Mutuals were ‘Chicagoed’ six times, the Forest Citys, five.”8 Before long, newspapers in several other cities, including Chicago’s own Tribune, had adopted it. When Albert Spalding began publishing his annual guides a few years later, he always included a tabulation of “Chicago games.” That and its adoption by the era’s pre-eminent sportswriter, Henry Chadwick in the New York Clipper, gave it life into the 20th century. Yet notwithstanding the facts of the term’s origins, confusion occasionally surfaced. In the late 19th century, The American Slang Dictionary, compiled by James Maitland, perpetrated the most common misimpression: that the term honored a Chicago achievement rather than a failure. “Some years ago Chicago had a base-ball club which met with phenomenal success,” Maitland wrote, explaining that “other competing clubs which ended the game without scoring were said to have been ‘Chicagoed.’”9 This reverse explanation occasionally lingers to today. 1. “The National Game,” Chicago Tribune, July 24, 1870, p. 4. 2. Burns has gone without a first name in almost every source of information about baseball games circa 1870; his first name was provided by the New York Times on June 12, 1871 (“St. John’s College Nine as Tourists”), quoting an announcement by St. John’s College of Fordham that he had returned as their Rose Hill club’s top pitcher. 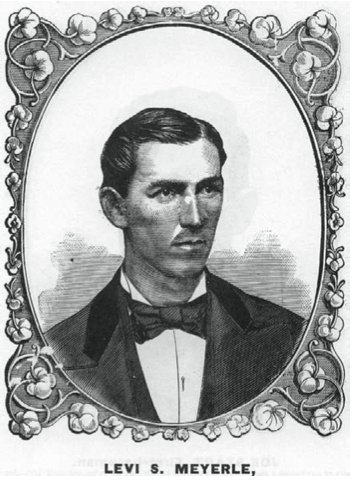 Burns was one of two Rose Hill players pressed into service for one game in May of 1870 by the Unions of Morrisania against the Athletics, and that figured into his first game with Chicago being played under protest by the amateur Star club of Brooklyn. Burns was released by Chicago after one month. 3. “The National Game,” Chicago Tribune, July 24, 1870, p. 4. 5. Spirit of the Times, July 30, 1870, p. 372 (referring to the Reds’ 14 – 0 win on June 15). 6. “The National Game,” New York Herald, July 27, 1870, p. 5. 7. Cincinnati Commercial Tribune, July 29, 1870, p. 8. 9. Maitland, James. The American Slang Dictionary (Chicago: R. J. Kittredge & Co., 1891), p. 64.